mTape by mLogic is currently doing a 60-day promotion for mLogic units that incorporate LTO-7 Tape drives. 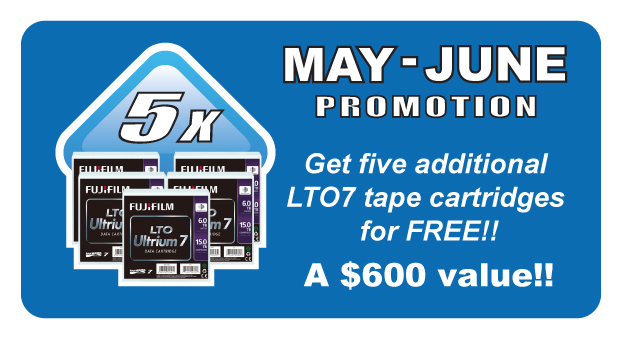 The Promotion is 5 additional FujiFilm LTO-7 Tape Cartridges for FREE. This is a $600 value to the enduser. Purchase any mTape or mRack LTO-7 Drive during the months of May and June 2017 from BackupWorks.com and qualify for 5 Free FujiFilm LTO-7 Data cartridges. Contact you BackupWorks.com Account rep today at 866 801 2944 for all your Thunderbolt storage needs like the mTape LTO-7 by mLogic.